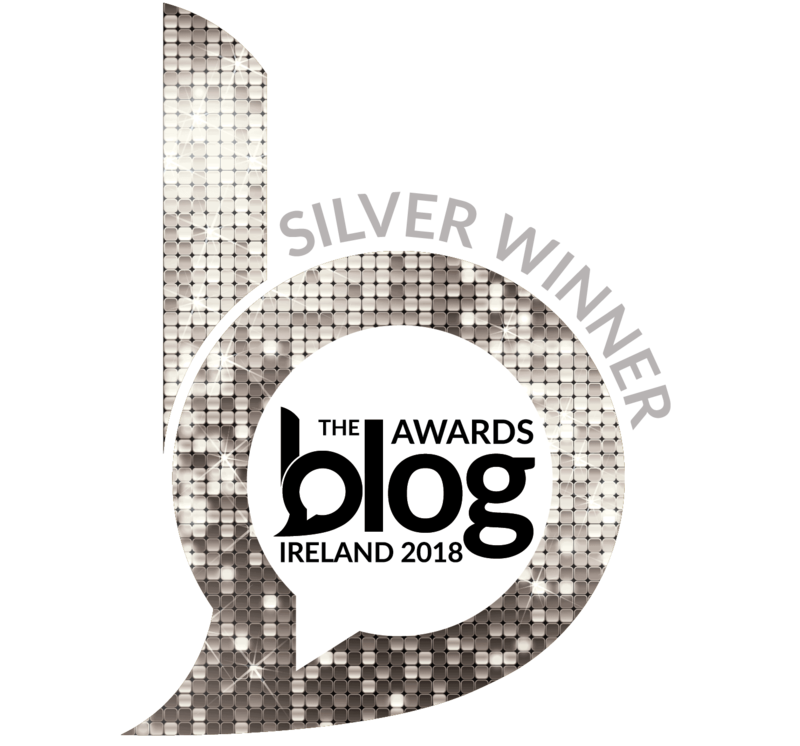 Christmas is here again and I’m delighted you’ve stopped by to check out my Christmas ramblings for 2018. 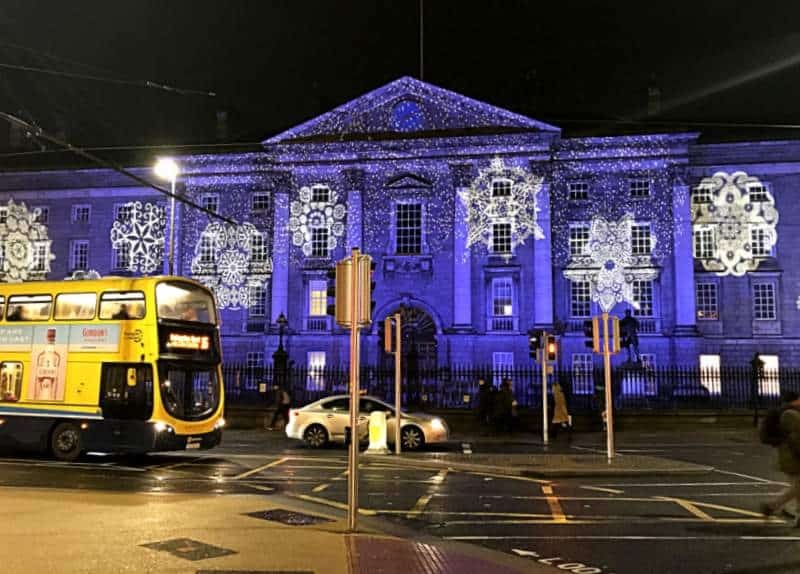 This year I’m spending Christmas in Dublin with family, and for those who are far away from Ireland this holiday season, I have a special treat. 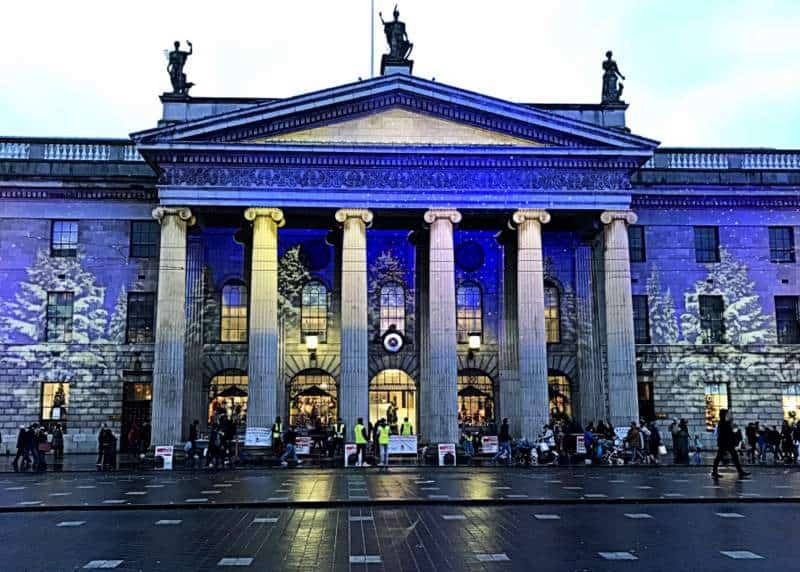 Yesterday I went wandering around Dublin, camera in hand, and captured a few shots of Dublin, all decked out for Christmas. 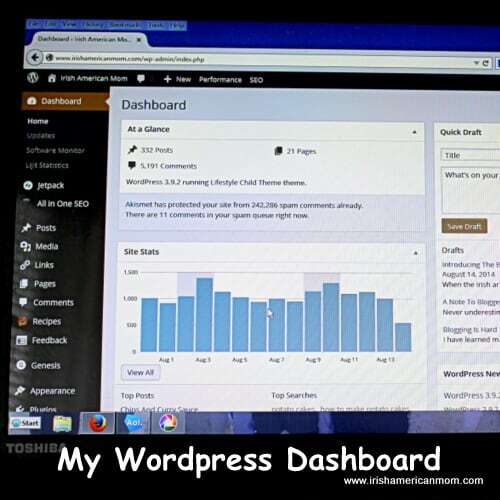 Here’s a short video montage with some of my photos. 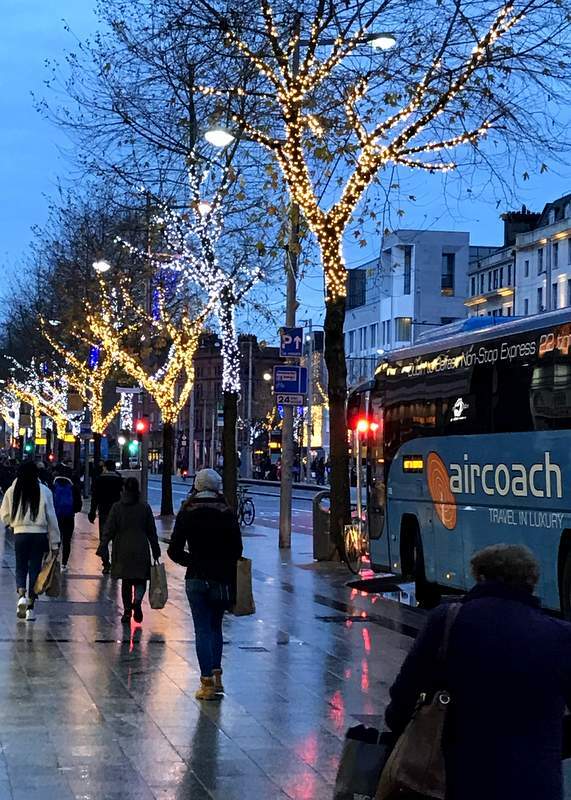 And for anyone who would like to pin some shots of Dublin to share Ireland’s capital city in all her Christmastime glory, here are a few of my photos…. 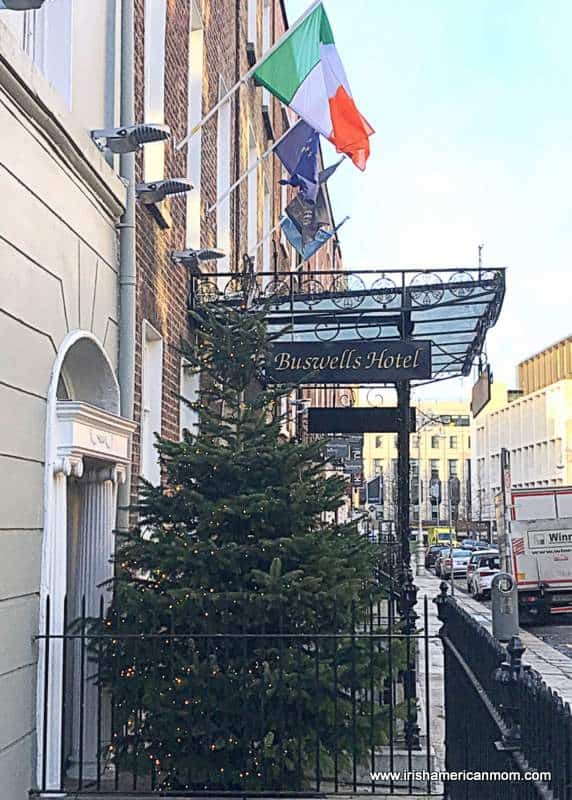 A Christmas tree outside Buswell’s Hotel opposite the Dáil. 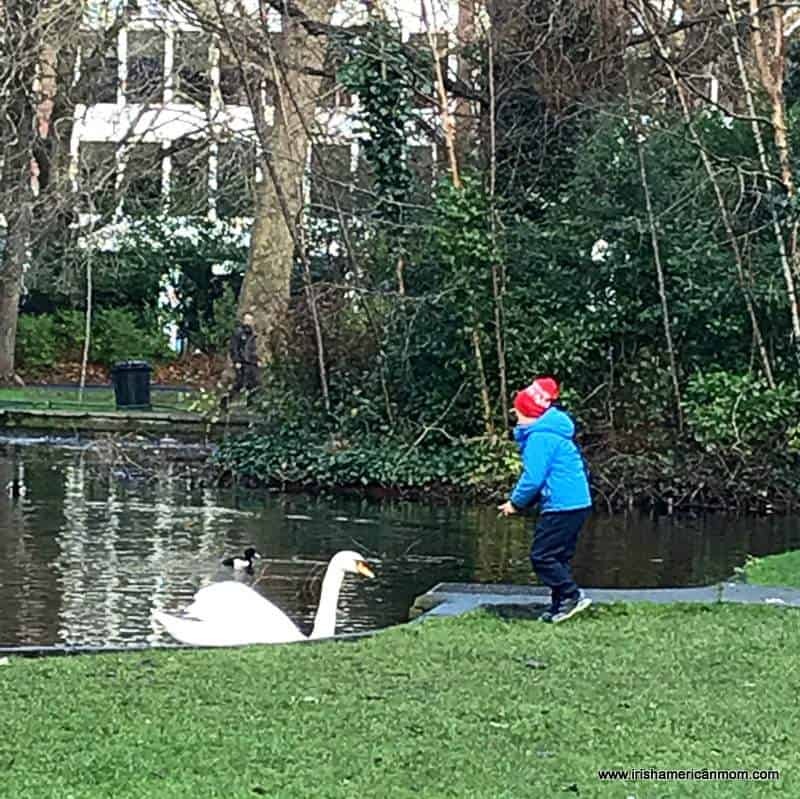 A child with a swan at the pond in St. Stephen’s Green. 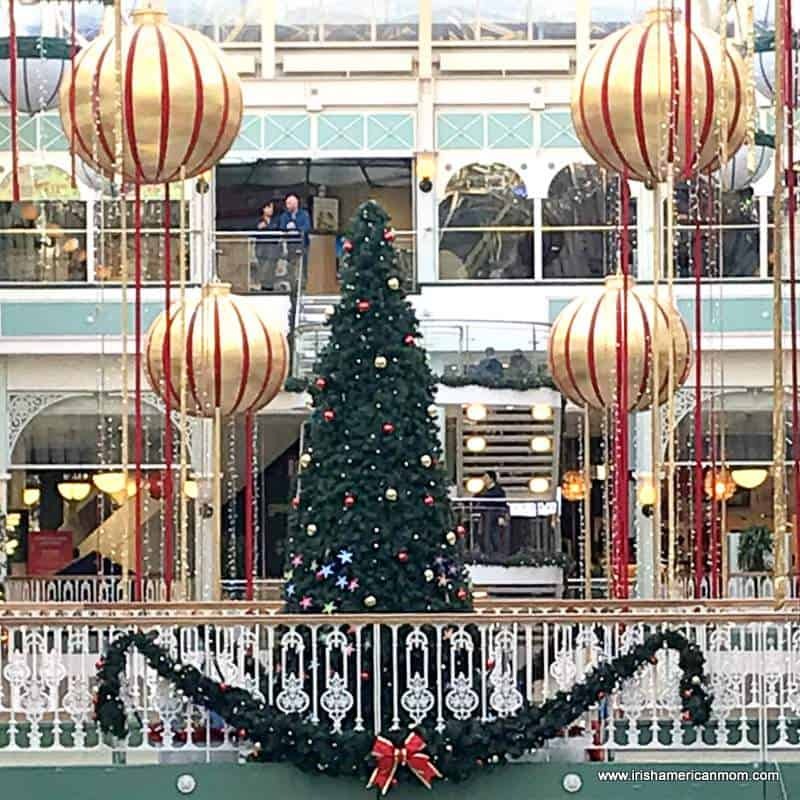 A Christmas Tree in the Stephen’s Green Shopping Centre. 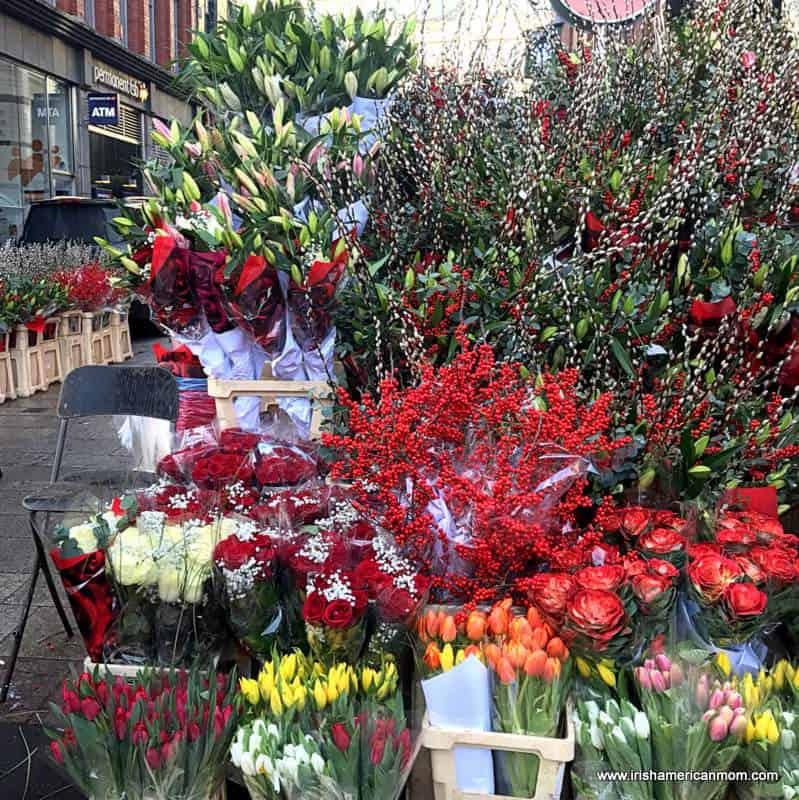 Christmas flowers for sale on Grafton Street. 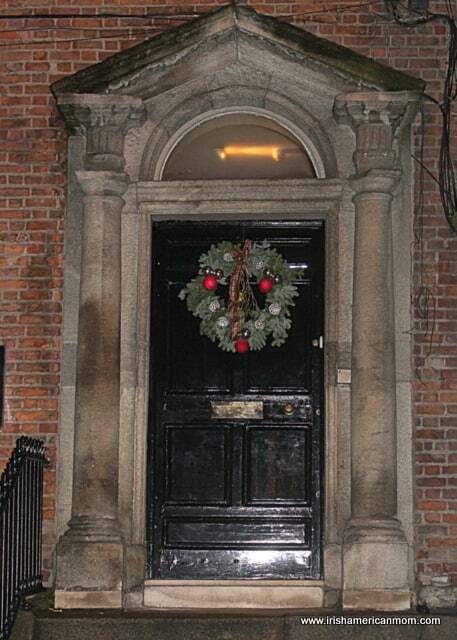 A Georgian door on Hume Street looking resplendent with a Christmas wreath. A house on St. Stephen’s Green. 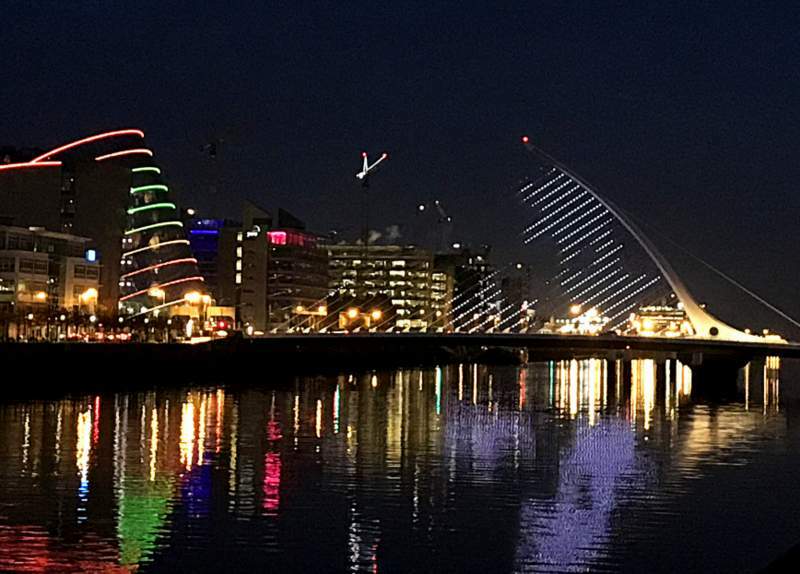 I hope you enjoyed this Christmas time tour of Dublin. May the joy and peace of Christmas be with you all. I wish you a season of blessings from heaven above. 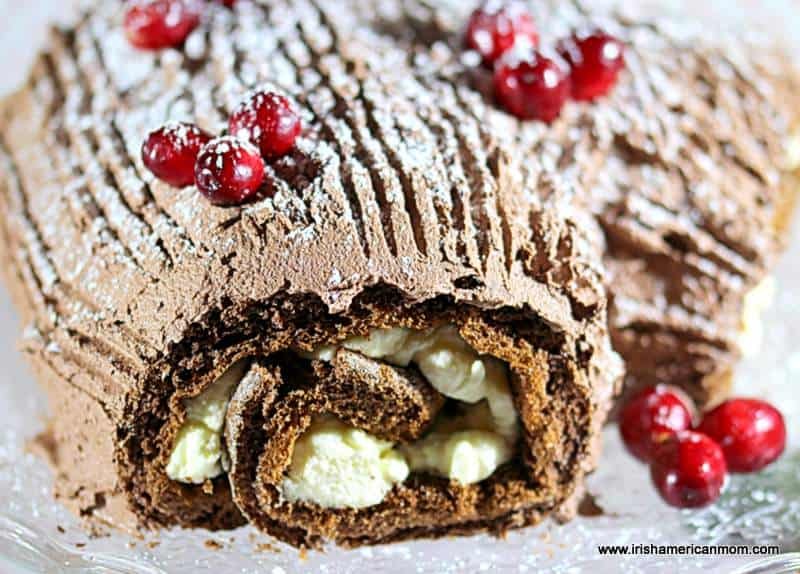 Chocolate Yule Logs are a Christmas time treat in Ireland and a baking tradition in many Irish homes, that started many, many years ago to remember a very old tradition. 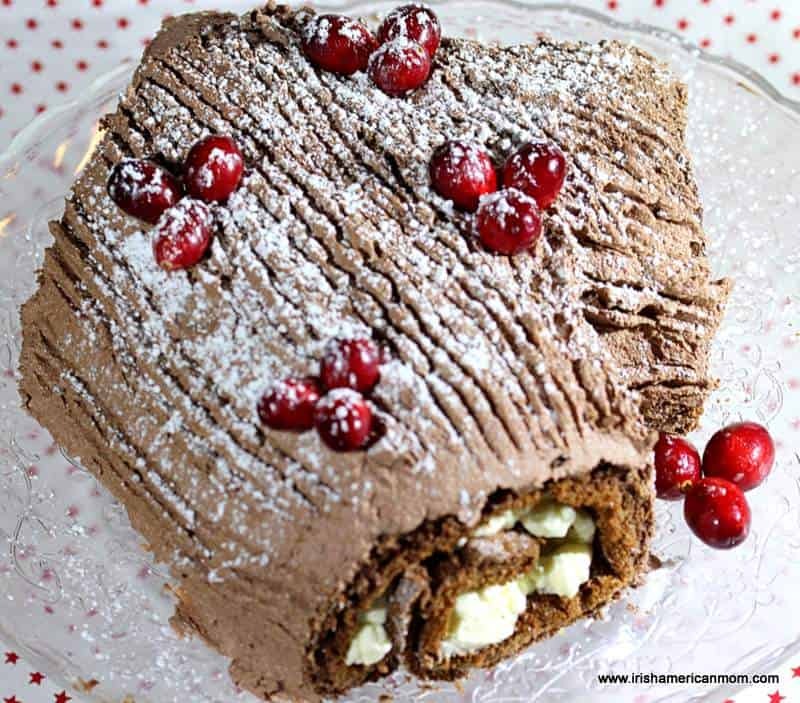 Christmas Chocolate Yule Logs are baked as a more modern representation of the enormous logs once burned in the open hearth all through the Christmas season. This historical practice of burning a Yule log is thought to be an old Norse tradition or it could also be Germanic in origin. Viking Norsemen may have brought this tradition to England and Ireland. The word Yule became part of old English, although the word has Scandinavian roots. Yule was the Scandinavian word for the Winter solstice. Over the past two centuries this dessert has become popular in many European countries. In Belgium it is known as a ‘Kerststronk’ which is a Flemish word. 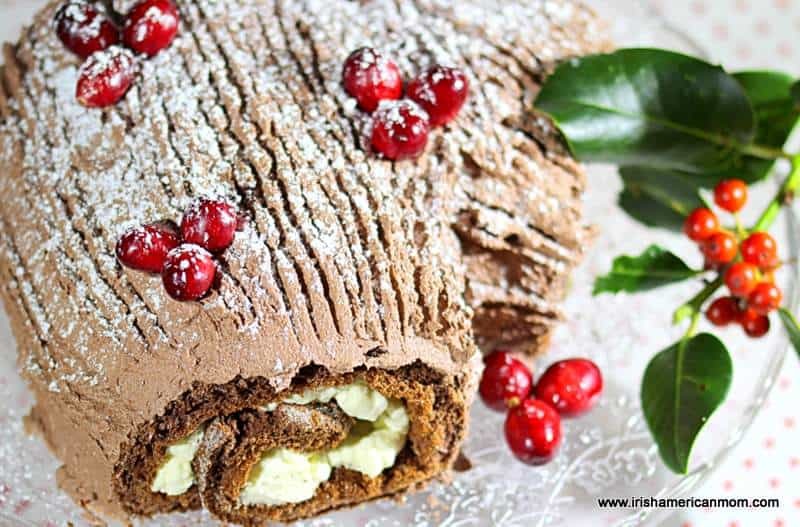 A Christmas Chocolate Yule Log consists of a chocolate sponge roll, filled with sweetened cream, and covered in chocolate butter cream frosting or icing. The outside is marked with a fork to resemble a bark-covered log. 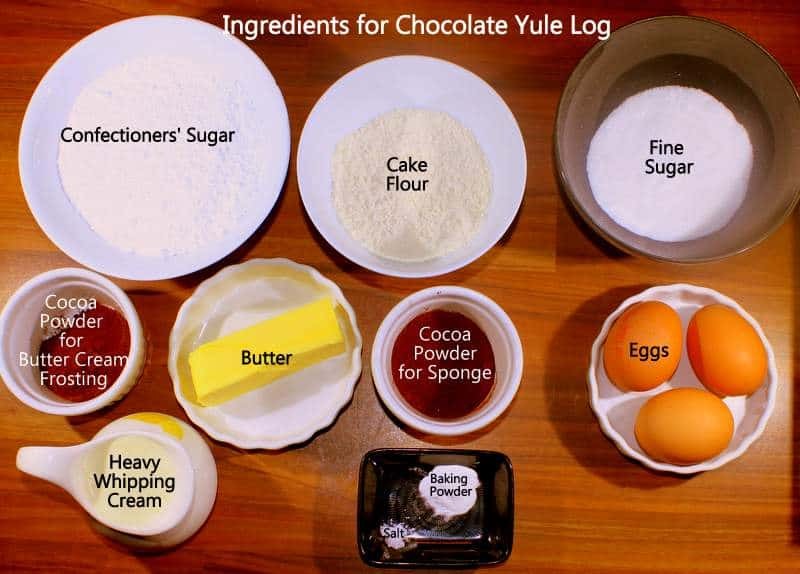 And so today, I thought I would share my Christmas Yule Log recipe, with step-by-step photographic instructions. First the sponge roll must be made, so go ahead and preheat the oven to 400 degrees Fahrenheit. This sponge is cooked at a high heat for a short time. The higher temperature helps the whipped egg batter to rise. 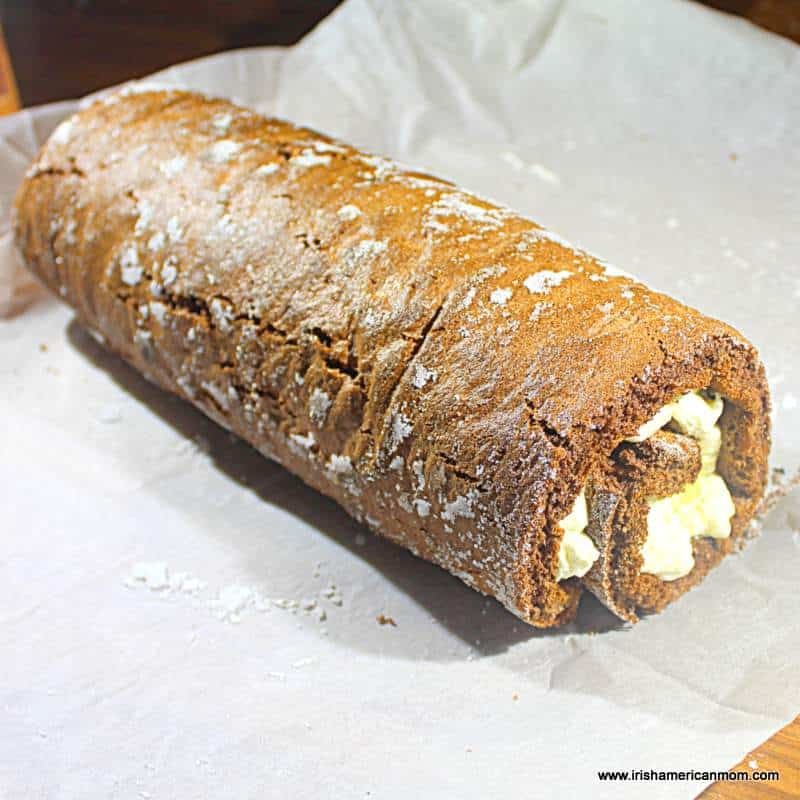 Prepare a swiss roll or jelly roll pan by greasing it and lining the bottom with a layer of parchment or greaseproof paper. You will need a 9 x 13 inch pan, which is a little smaller than the standard jelly roll pans most frequently used in the United. States. Next, separate the eggs and put the yolks to one side. Place the egg whites in a large clean dry bowl if using a hand held electric mixer, or in the bowl of a standing electric mixer. It is important that the bowl is completely clean and dry if the eggs are to incorporate air as they are whipped. Add a pinch of salt to the egg whites. Beat until the mixture is stiff. It will be a little dry looking in ap­pearance. It takes a few minutes of beating to add an adequate amount of air to the egg whites. Next, add the sugar and continue beating. The mixture will become thick and glossy looking. 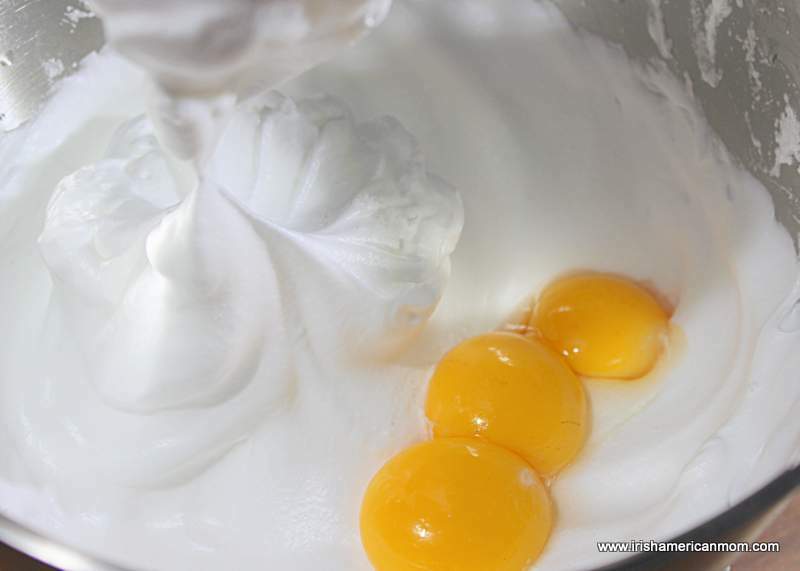 Beat in the egg yolks with the whipped egg whites. 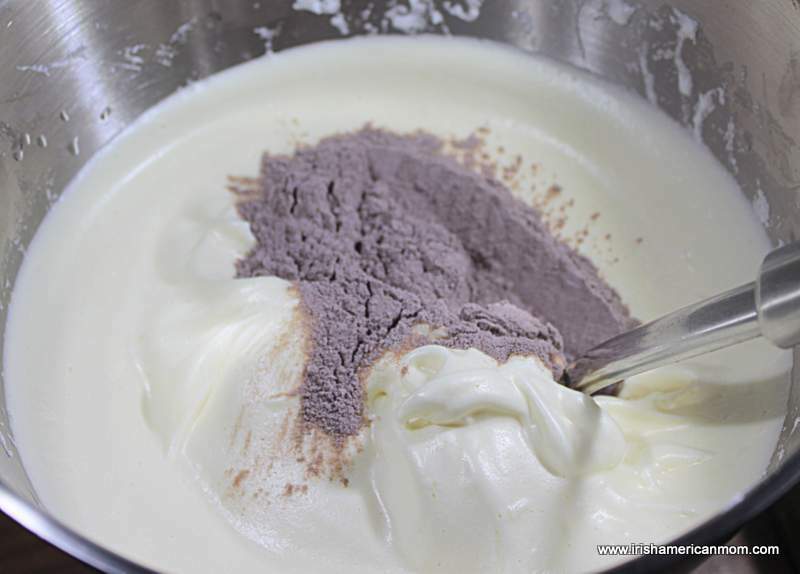 The mixture will become a very pale yellow color and will be thick enough that the beater will leave a trail in the batter when removed from the bowl. Sift the flour, cocoa powder and baking powder together in a separate bowl. This recipe calls for 1 US teaspoon of baking powder which is a scant level teaspoon in Ireland. Add half the flour mixture and gently fold it into the egg mixture with a metal spoon. 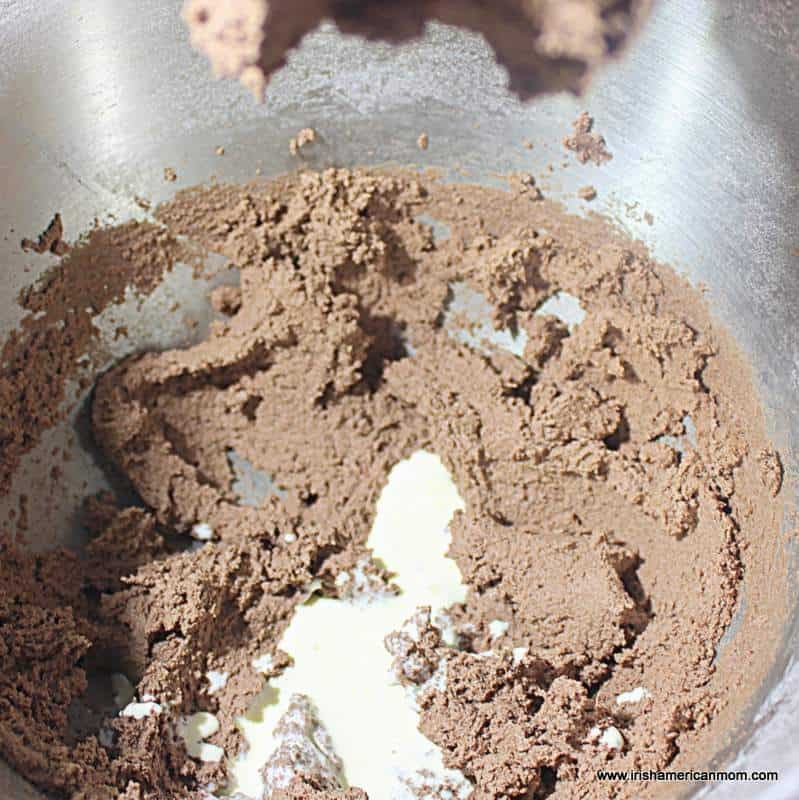 Add the remaining flour, baking powder and cocoa powder mixture and continue to gently incorporate it into the egg mixture. 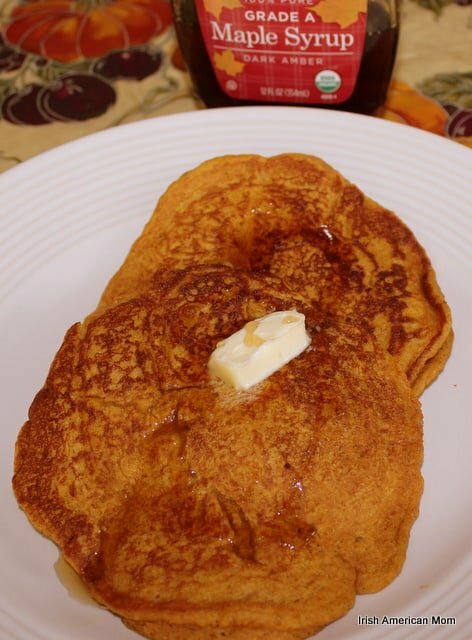 Be sure to lift the egg mixture at the bottom of the bowl as you fold, ensuring there are no air pockets filled with flour that could be left unincorporated into the batter. 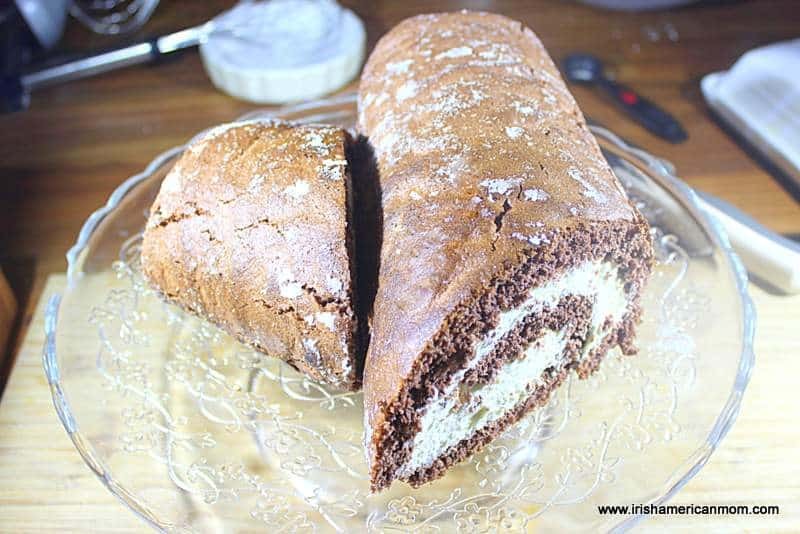 Pour the batter into the prepared swiss roll or jelly roll pan and spread it evenly. Be sure to move the batter into the corners of the pan. 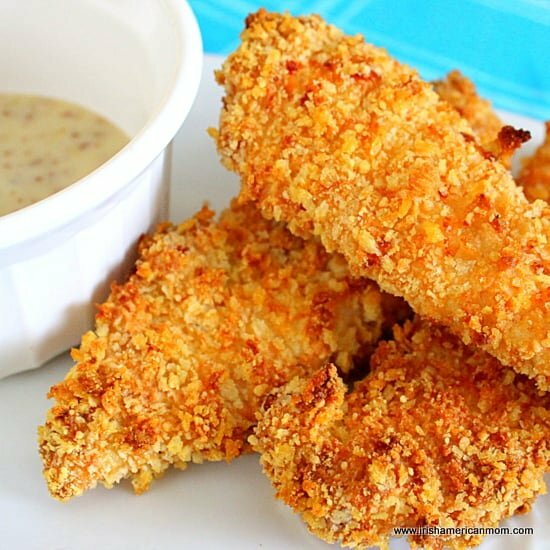 Bake it on the top shelf of the preheated 400 degree Fahrenheit oven for 10 minutes. Lay a sheet of parchment or baking or greaseproof paper on the counter. Sprinkle it with a light dusting of fine white sugar. This sugar prevents the sponge from sticking to the paper as it cools in the shape of a roll. When the cake is baked it will be a rich brown color and spongy to touch. Turn the baked sponge roll onto the sugar dusted paper. Trim the outside longer edges of the sponge with a sharp knife. This makes it easier to roll the sponge. Roll the cake up with the paper inside. You start the roll from the shorter width ways edge, not the longer side. Leave to cool wrapped in the paper. 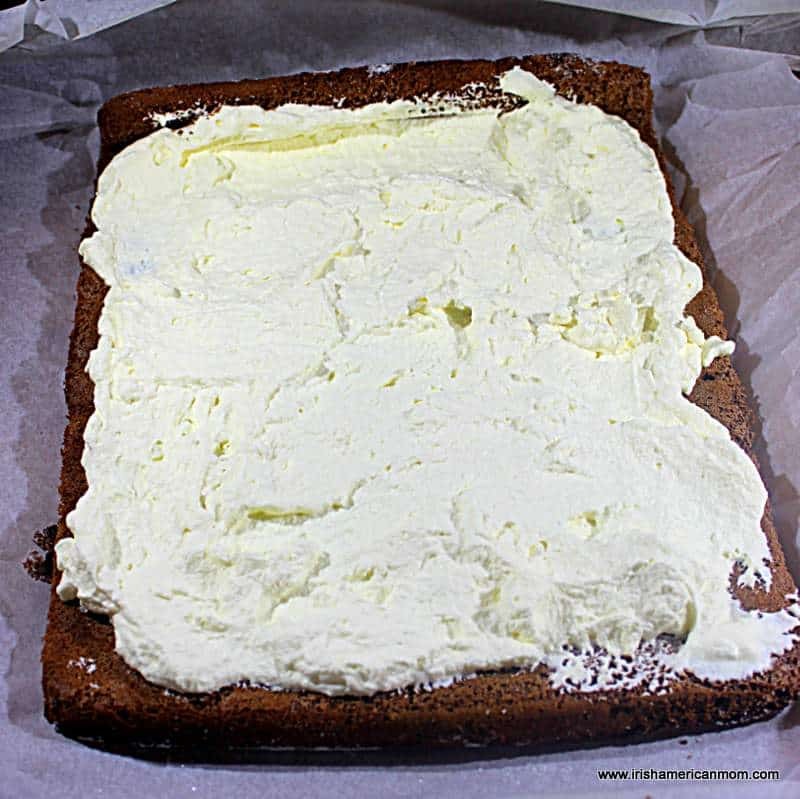 When the cake has cooled, whip the cream with two tablespoons of confectioners’ sugar to sweeten. Carefully unwrap the rolled sponge, and fill it with cream. Gently re-roll the filled sponge. Next, the butter cream frosting or icing must be prepared. This can also be done while the sponge cake is cooling. 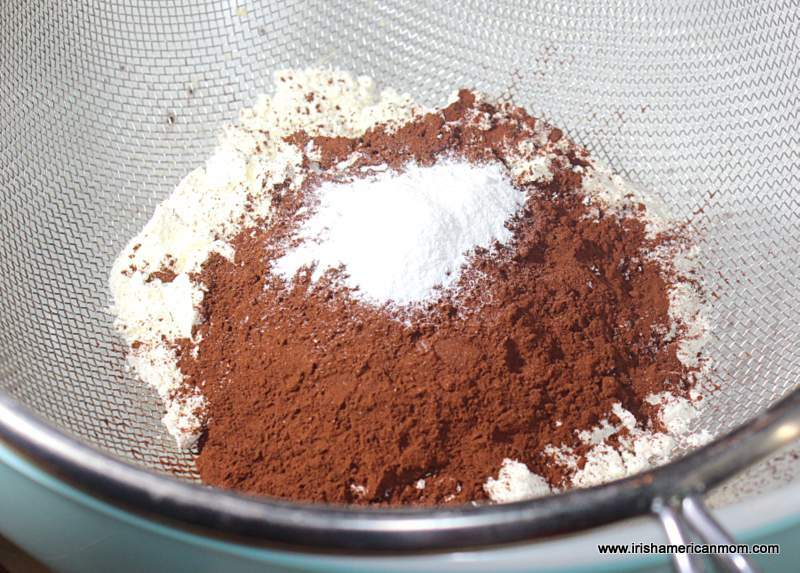 Sift the cocoa powder and confectioners’ sugar together in a bowl. Add the butter and beat well until the mixture starts to lighten in color. Add two tablespoons of heavy whipping cream to the frosting and continue to beat with an electric mixer for another 3 to 4 mintues. 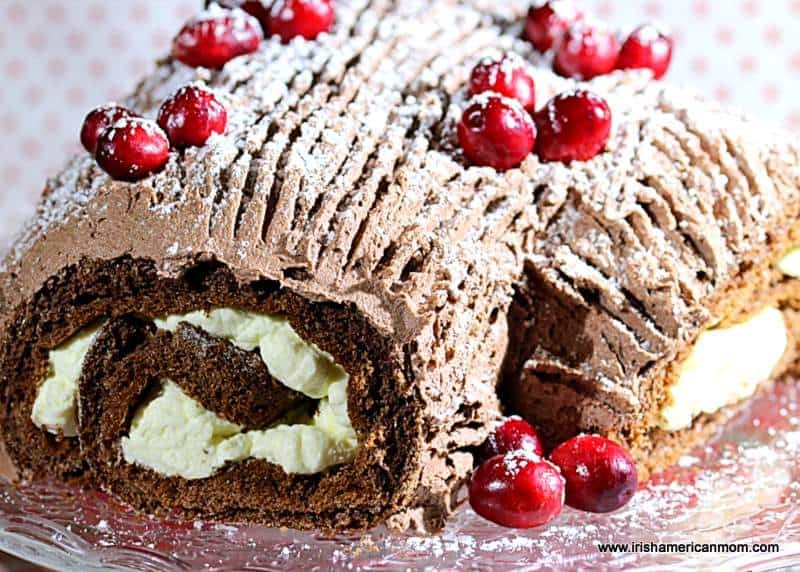 Before spreading the icing over the outside of the log, you can create a branch like effect with your chocolate roll. Cut a diagonal piece from one end of your log and place it to the side of the main piece. Spread the chocolate frosting over the outside of the main log and its branch, joining the two pieces together with frosting. Using a fork, mark the frosting with lines to give the effect of tree bark. Don’t worry about keeping the lines exactly parallel. The more imperfect the finish, the more realistic looking the cake will be. If desired, decorate the top with cranberries or raspberries. Dust the top of the cake with confectioners’ sugar which resembles snow. 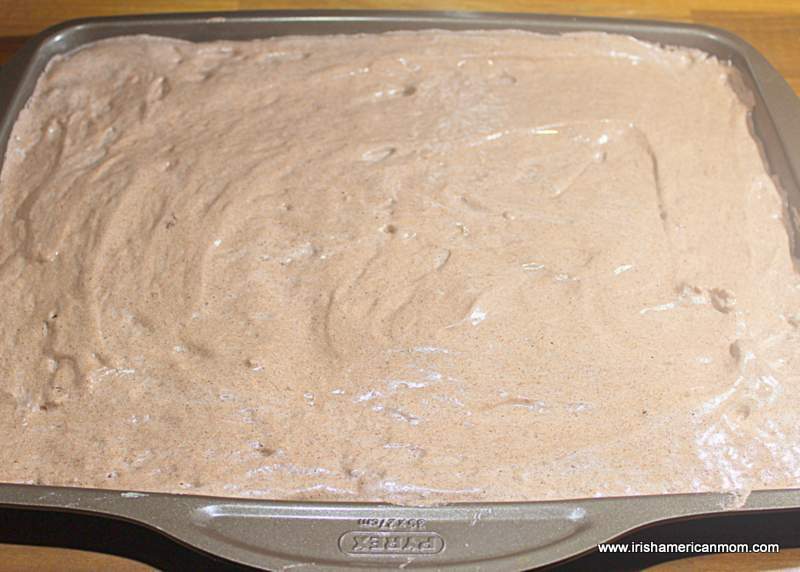 And there you have it – my recipe for a favorite Irish Christmastime cake. 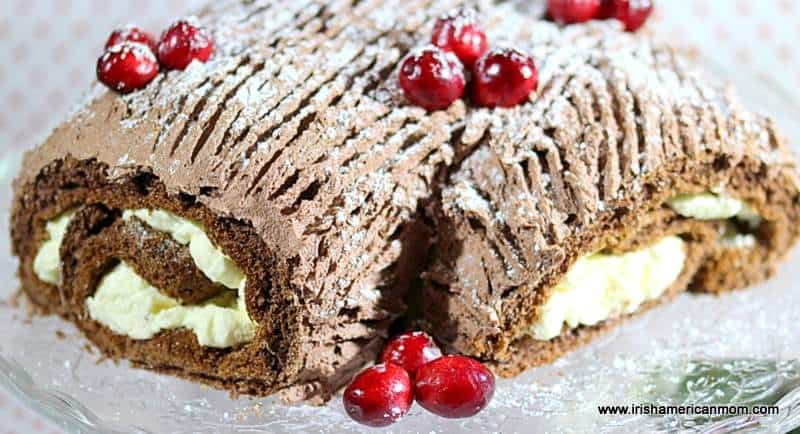 Christmas Chocolate Yule Log is a favorite cake in Ireland, and consists of a chocolate sponge roll filled with whipped cream and covered in a chocolate butter cream frosting. 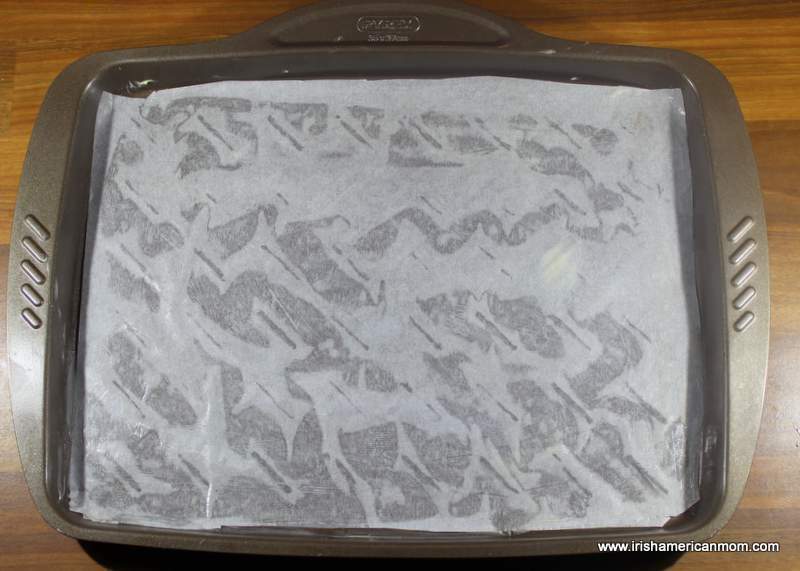 Grease and line the bottom of a 9 x 13 inch swiss roll pan with parchment paper. Separate the eggs and put the yolks to one side. 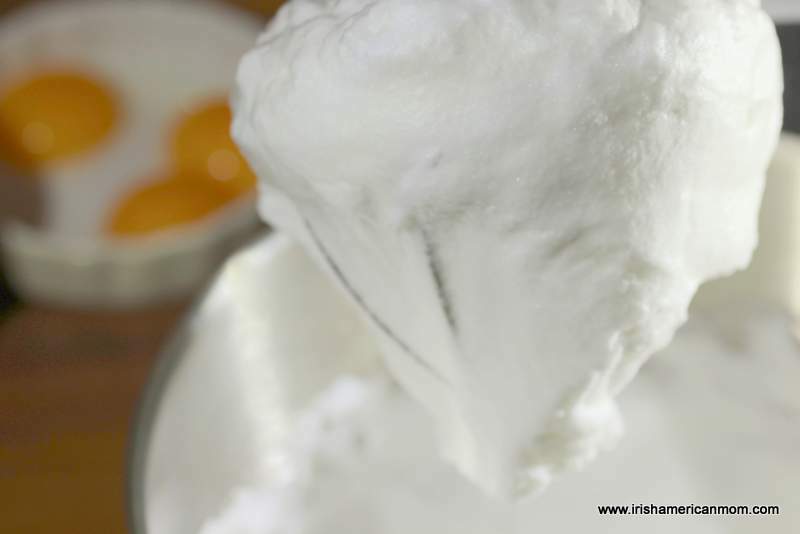 Add the egg whites to a large clean dry bowl with a pinch of salt and beat until the mixture is stiff and dry looking. Add the sugar to the egg whites and beat for a further 3 to 4 minutes until thick and glossy. Add the egg yolks and beat until thick. 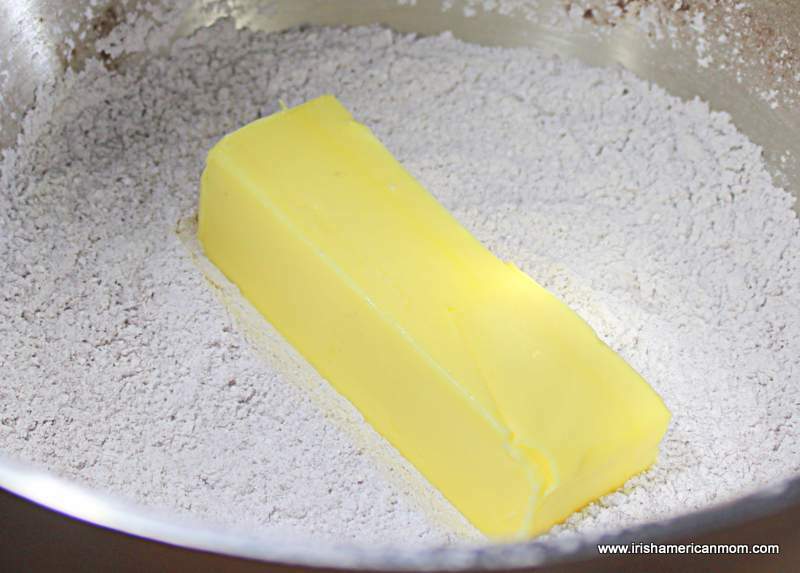 Gently and gradually fold the flour mixture into the beaten eggs with a metal spoon. Pour the batter into the prepared swiss roll pan and spread out evenly. Bake in the pre-heated oven on the top shelf for 10 minutes. 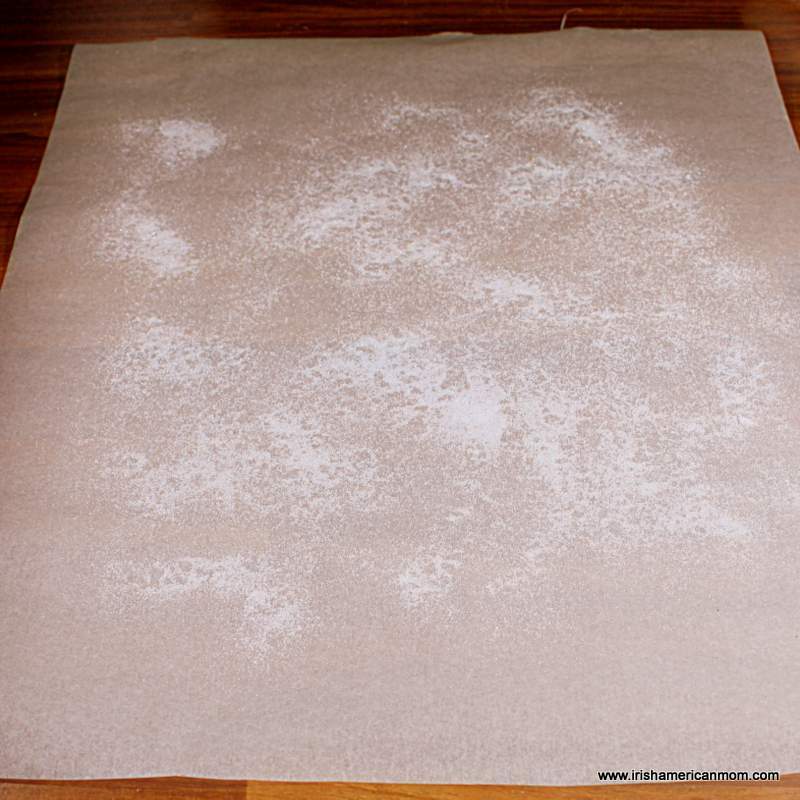 Lay a sheet of parchment paper on the counter and sprinkle it with a light dusting of fine white sugar. 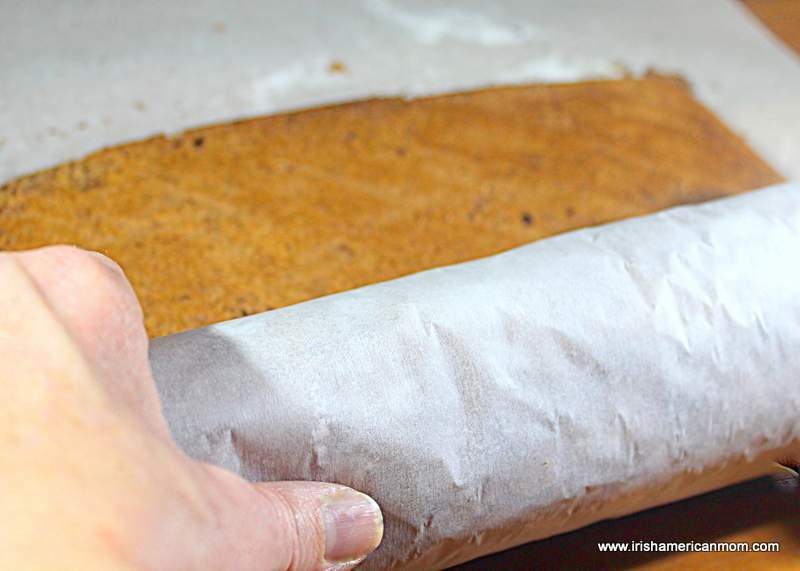 Turn the baked sponge roll onto the sugar dusted paper. Remove the lining paper. 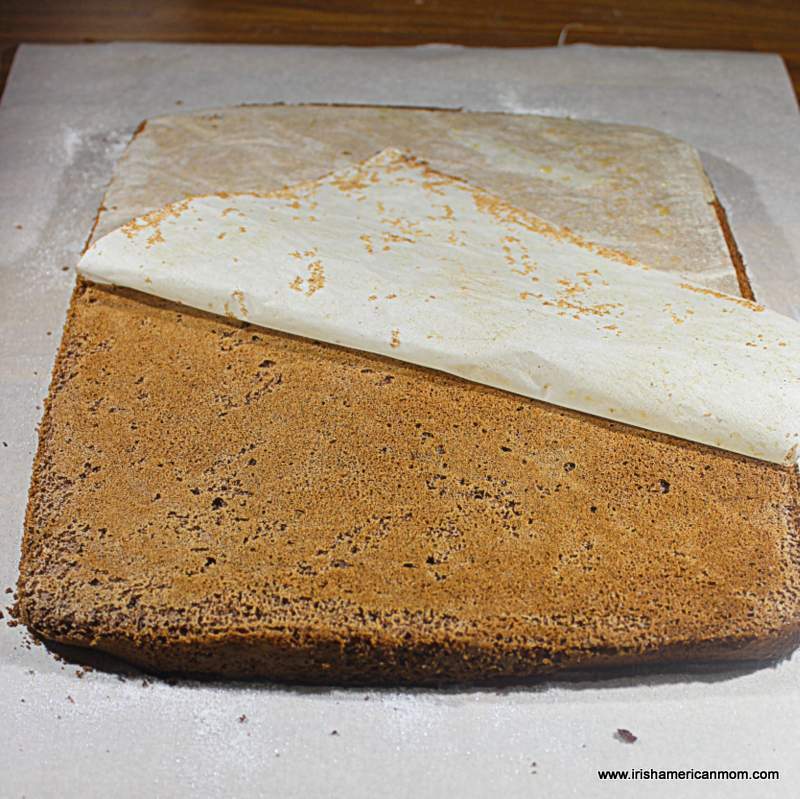 Roll the cake up with the paper inside, and starting from the narrower edge. Leave to cool wrapped in the paper. When the cake has cooled, whip the cream with two tablespoons of confectioners’ sugar to sweeten. Carefully unwrap the rolled sponge, and fill it with cream. Gently re-roll the filled sponge. 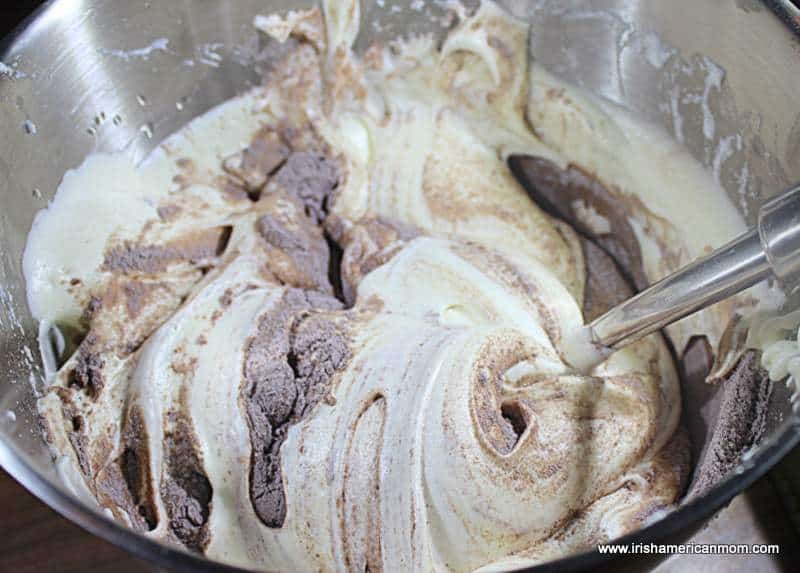 Sift the cocoa powder and confectioners’ sugar for the frosting together in a bowl. Add the butter and beat well until the mixture starts to lighten in color. 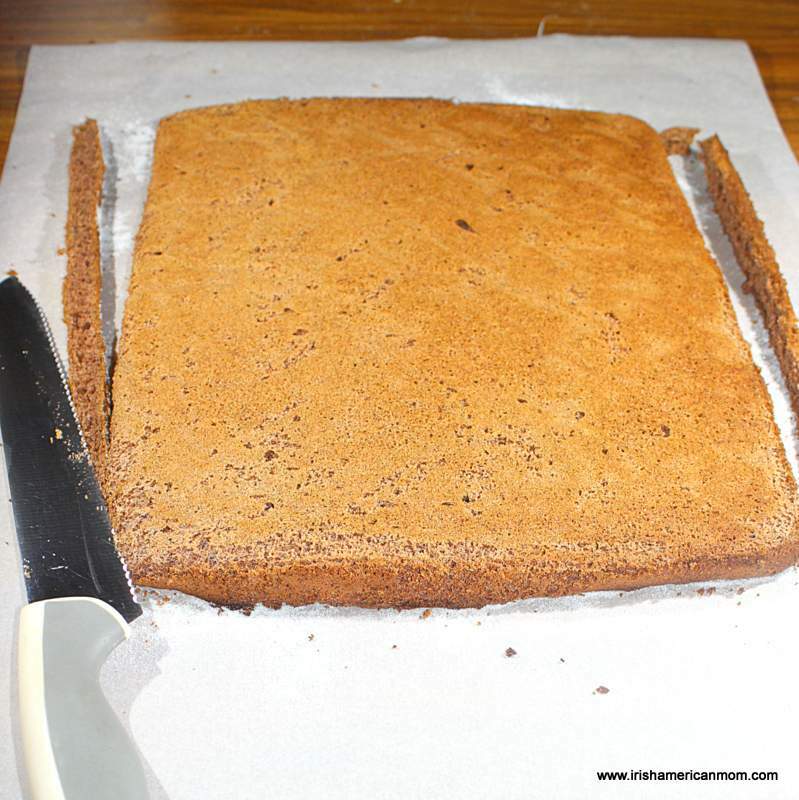 Cut a small diagonal piece from one end of the cake log and place the smaller piece to the side of the main piece. Decorate the top with cranberries or raspberries. Dust the top of the cake with confectioners’ sugar which resembles snow. Happy Christmas baking to all. Holly branches festooned in red berries together with ivy leaves were transformed into festive Christmas decorations when I was growing up in Ireland. Have you ever wondered why this beautiful greenery is associated with Christmas? Why are we drawn to nature at this time of year, when the days are longer and the nights seem darker? Are we simply wired to bring the outside in to celebrate this joyful season? 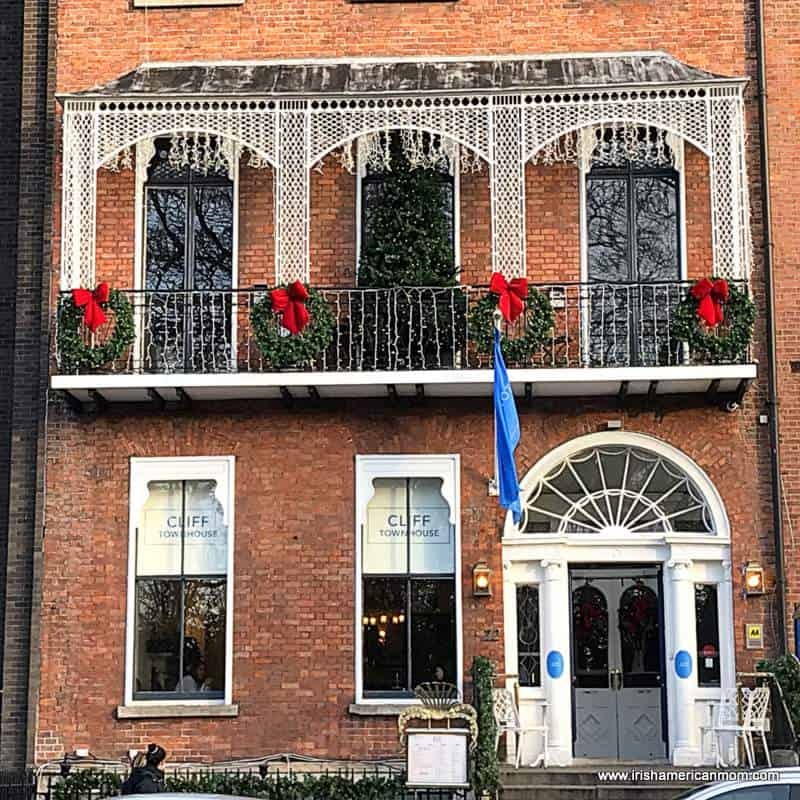 Red poinsettias are displayed all over Ireland today, but when I was growing up in the 1970’s I never laid eyes on these Christmas favorites. No! Holly was the go to decorative plant during my childhood Irish Christmases. Perhaps, in years gone by, decorating a home was made easy and inexpensive by snipping branches from vegetation growing nearby. 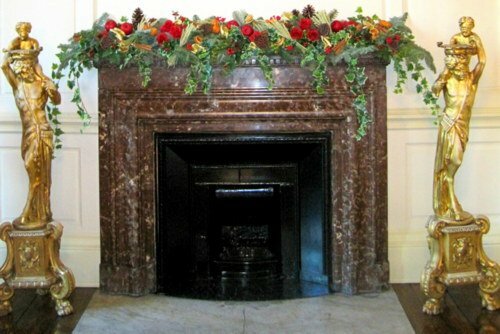 But the ornamental use of holly was not confined to the poorer classes in Ireland in the 19th century. Even the wealthiest and grandest homes, especially in Victorian times, boasted decorative holly boughs, adding to their festive cheer. 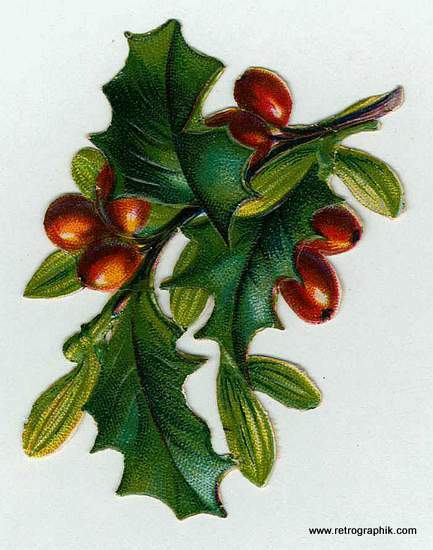 Vintage Christmas cards from the British Isles often feature red berried holly sprigs. 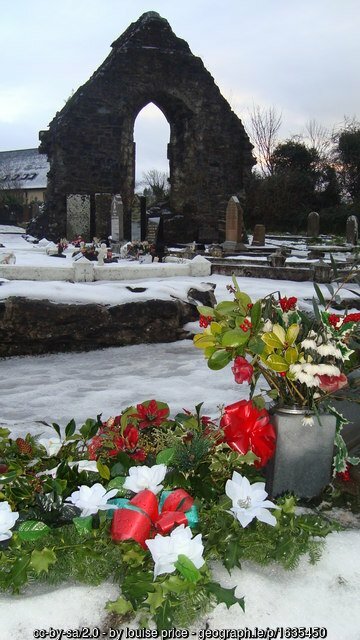 And in Ireland, Christmas wreaths of holly are hung on doorways and are frequently laid on graves at Christmas time. Let’s explore this old tradition in today’s blog post. 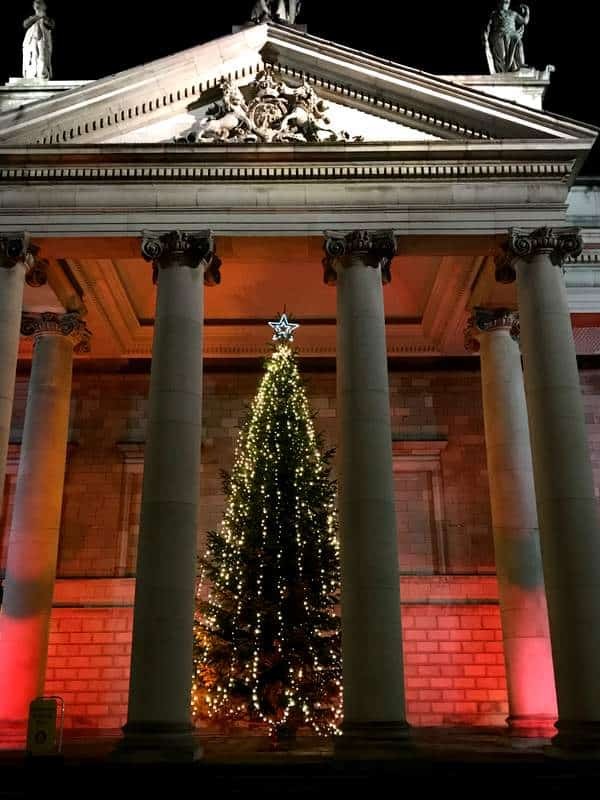 Christmas trees may be very popular in modern Ireland, but they were not introduced to Ireland until the early 1840’s by wealthy Anglo Irish Victorians. The custom was first introduced to Britain by Prince Albert, the German husband of Queen Victoria. 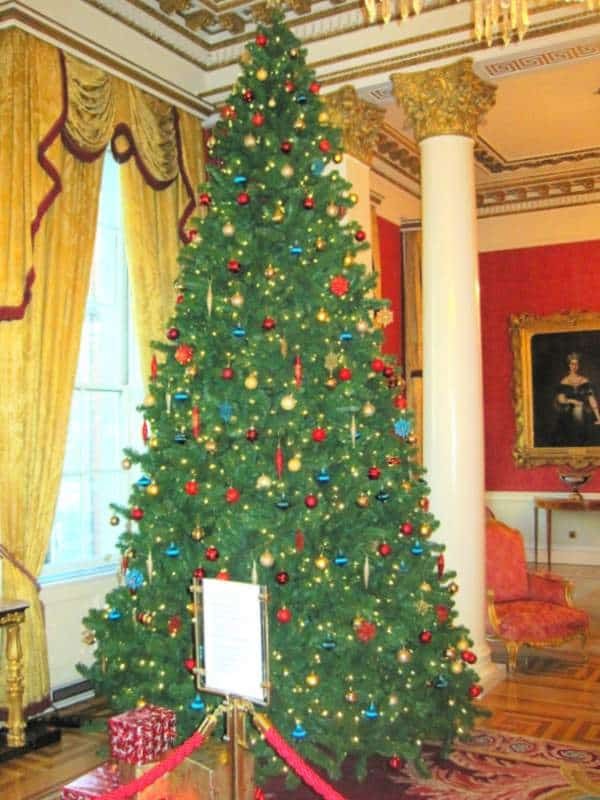 After an image of the British royal family, with their decorated Christmas tree at Windsor Castle, was published in the Illustrated London News in 1848, Christmas trees became very popular in England. The custom took hold in Ireland over the coming decades. 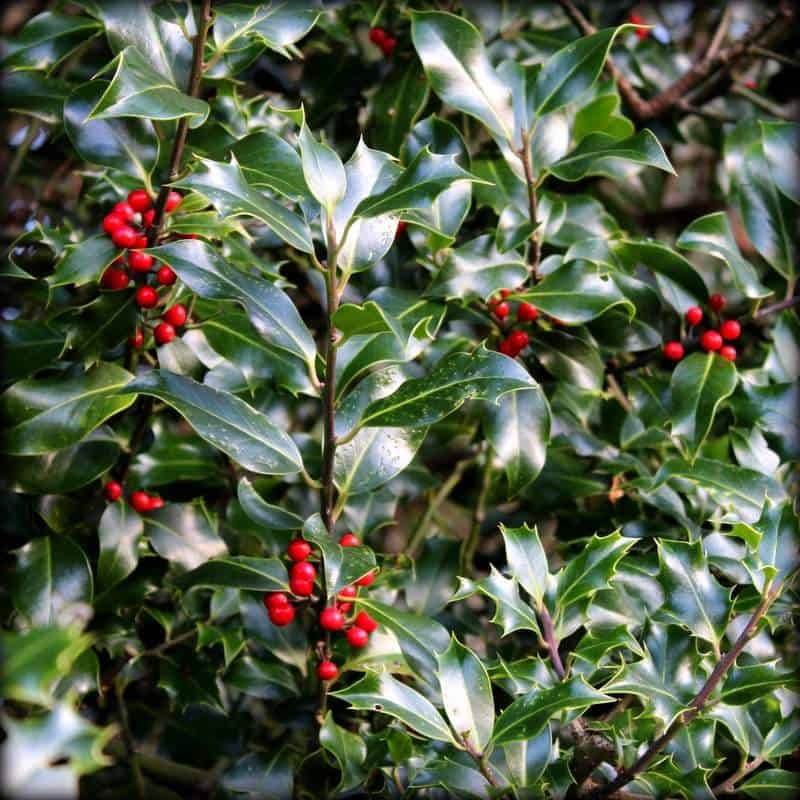 Holly flourished in Ireland’s winter season and could be found growing all around the Irish countryside. Nature’s bounty meant even the poorest of Irish people could afford to decorate their homes for Christmas. The great outdoors provided a rich treasure trove of green and red embellishments to brighten up Ireland’s rural cottages. Of course, berried plants were the most popular, with their contrasting red and green hues adding to their appeal. The berries are devoured by birds, but are poisonous to humans. For this reason, decorative sprigs of holly were kept out of reach of little ones. In days gone by, there were no cans of snow spray to add white snow-like highlights to green leaved branches. But our ancestors were creative and starch would have been used to make a snow effect. Our ancient Celtic ancestors twinned the holly plant with the sacred oak tree. The oak was believed to be the controller of light during the spring and summer months, but the holly presided spiritually over the darker six months of the year. 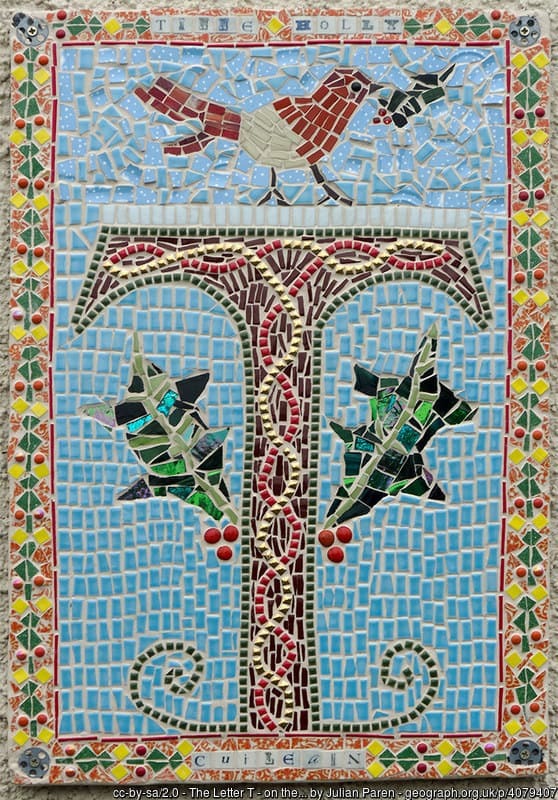 In the Celtic tree calendar, holly is linked to the eighth month. It was said that at mid-summer the holly won the battle over light with the oak, and gained control of the coming darker months. Ogham (pronounced OH-am) is the ancient Celtic form of writing and its alphabet is sometimes called the “Celtic Tree Alphabet.” Each letter of the Ogham alphabet is assigned a tree or plant name. The letter ‘T’, or Tinne was associated with the holly tree and was the eighth letter of the old Ogham alphabet. T is for Holly and the Celtic word for holly was ‘tinne’ (pronounced tin-neh) which is very close to the word for fire which is tine. 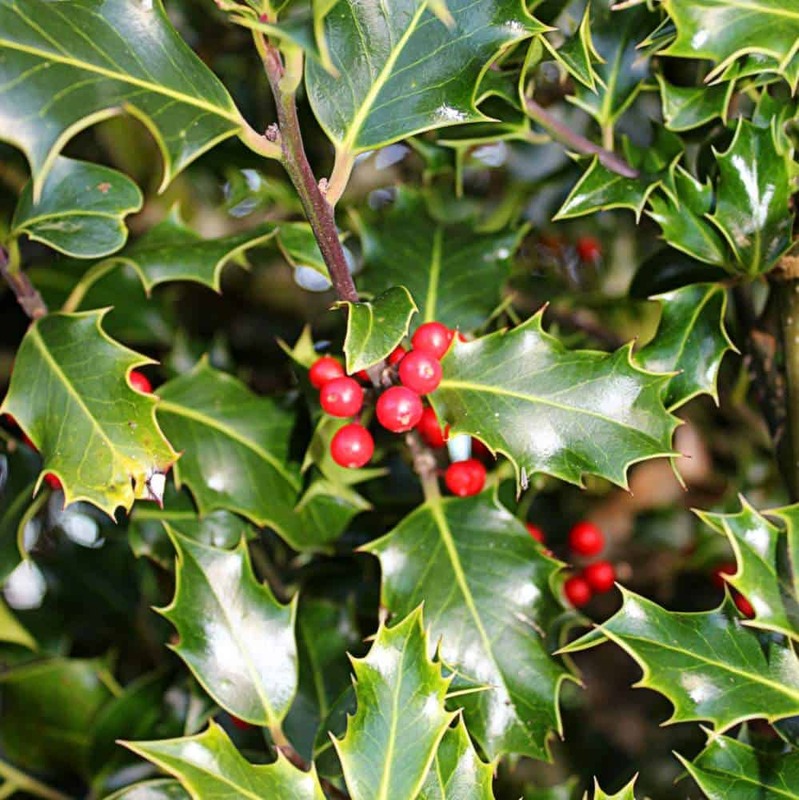 The Gaelic or Irish word for holly is cuileann (pronounced kwill-en). Holly was revered because it was an evergreen and the druids believed it special because it helped to keep the earth beautiful when the other trees shed their leaves. Holly was considered a protective plant. A holly tree does not conduct lightening, so they were often grown beside homes for protection. Holly was also said to have important spiritual attributes and the druids believed it could guard against witchcraft and evil. 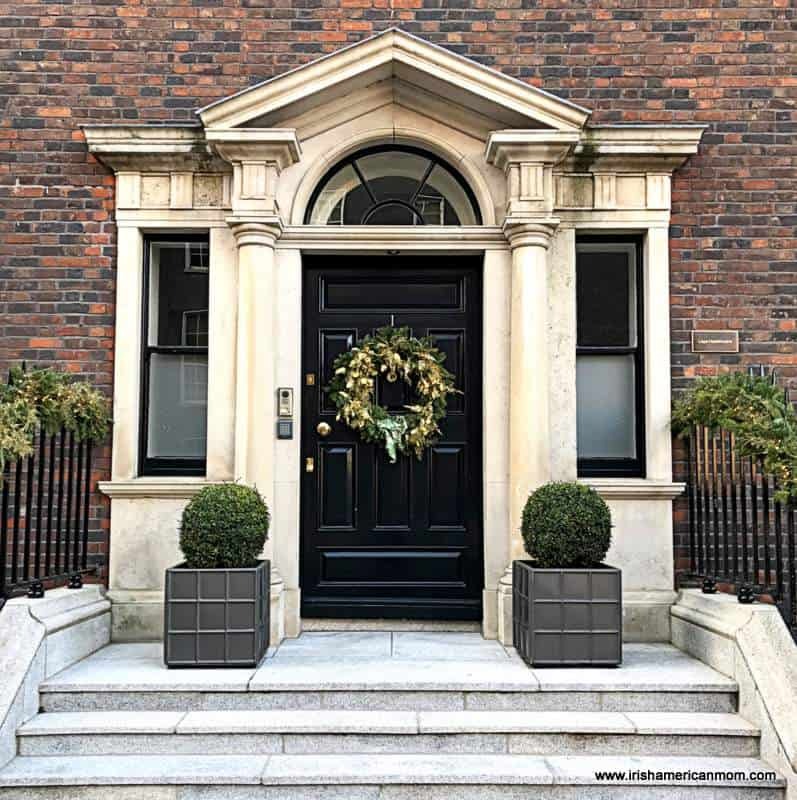 The Irish loved to decorate their doors and windows with holly believing its spikes could capture evil spirits and prevent them from entering the house. 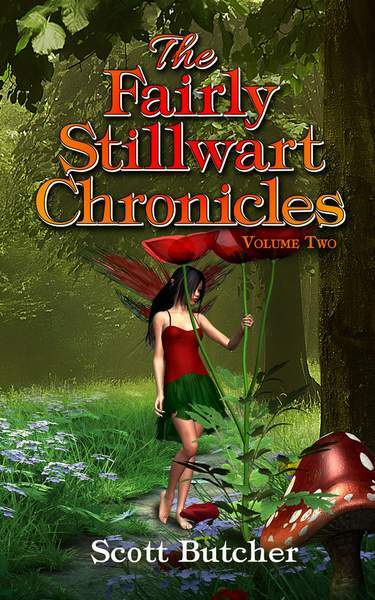 Holly around the home also became a safe haven for the faeries, who would guard against more sinister forces. Bringing holly into the home brought good fortune. But be warned. Only snippets of the plant should ever be taken. Cutting down a full tree was thought to bring bad luck. Isn’t it nice to know the druids were conservationists way back when, in ancient times? Celtic chieftans were crowned with a wreath of holly to bring good luck to their reign. New born babies were bathed in water made by soaking and boiling holly leaves. And all these things were done because of deep seated Celtic beliefs in the protective power of holly. 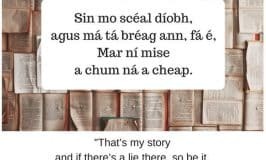 After Ireland turned to Christianity in the 5th century, our ancestors did not turn their backs completely on their old Celtic belief system. Instead, they adapted it to suit their new faith. It was said that holly was used to form part of the crown of thorns worn by Jesus, and it was the blood of our Lord that stained the berries of the plant red. Irish folklore tells how an angel stands on each spike of the holly leaf and children prayed to these holy holly angels on Christmas Eve. Tradition says that on this holy of holy nights, no prayer was left unanswered. 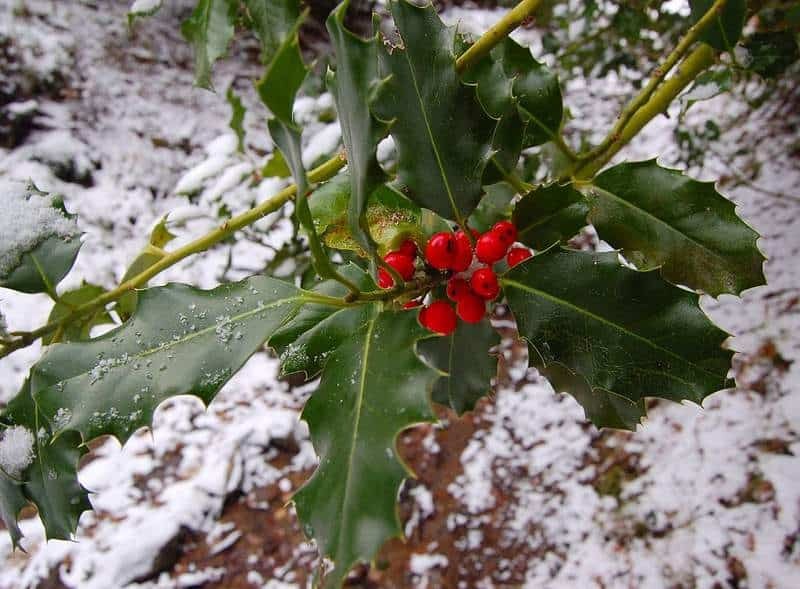 Other superstitions were associated with the holly plant. If holly was the first evergreen plant to be brought into the house at Christmastime, then it was said the man would get the upper hand and rule the roost for the coming year. For that reason, women usually instructed that the ivy be collected first, then the holly. Timing of taking down the holly was also very important. Once brought inside it must not be discarded or taken down until after Women’s Little Christmas, on the 6th of January. Throwing away a symbol of good fortune too soon could mean you were looking for trouble. 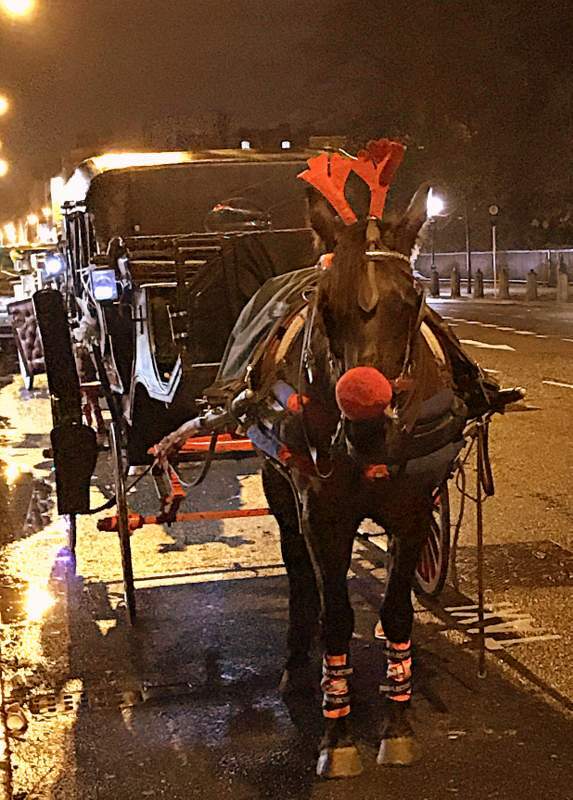 Kissing under the mistletoe is a New Year’s tradition that was not originally linked with Ireland. 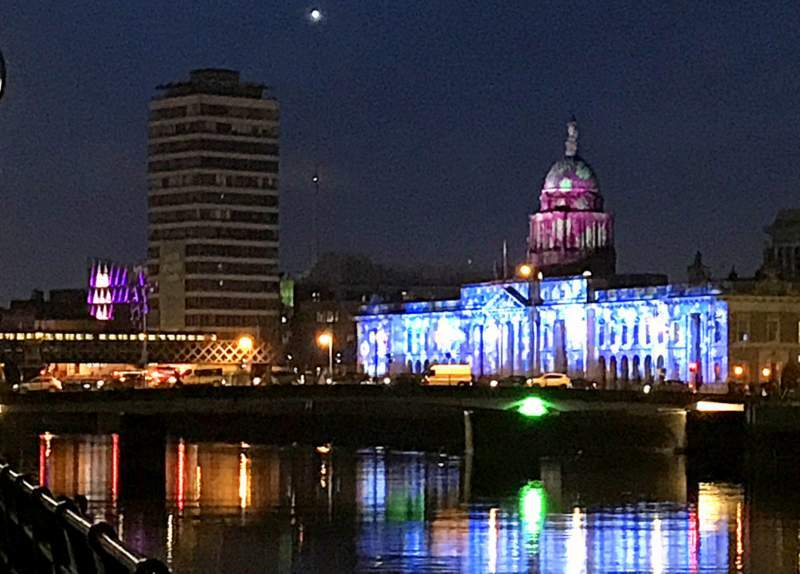 In fact, the Irish did not celebrate the New Year on January 1st in ancient times. 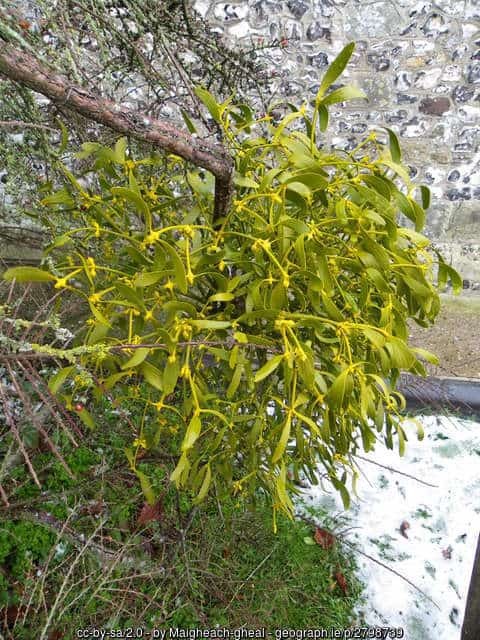 Mistletoe is native to England but is hard to find in Ireland. It was only cultivated in Ireland by English settlers in Victorian and Edwardian times. Mistletoe was not traditionally a very common decoration in Ireland, and therefore would not have featured in the decorative wreaths created by our ancestors. 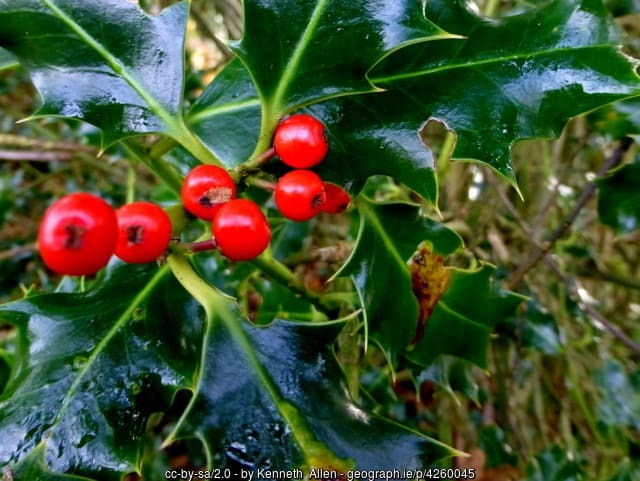 And there you have it – a quick round up of facts and Irish folklore related to the holly plant. I hope you enjoyed this short exploration of the significance of holly as an Irish Christmas decoration. Have a wonderful Christmas season and enjoy the process of decorating your home in anticipation of this beautiful holiday.